In an unequal world, conditions of living that promote ill-health and extreme inequity in access to healthcare services prevents a majority of the world’s population from leading healthy lives. The collapse of public health systems in many parts of the world and the rising commodification of healthcare in several regions, depict the inability of the current neoliberal order to address the rising crisis in health. Accompanying these trends is a global order where governance for health is being held captive by private foundations and corporations. 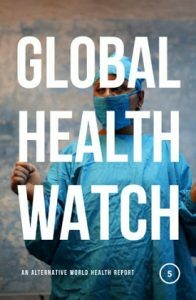 This is the context that informs the contents of the 2017 Global Health Watch (GHW) report. Published by Zed Books and now in its fifth edition, the GHW is widely perceived as the definitive voice for an alternative discourse on health. This new edition addresses the key challenges facing governments and health practitioners today, within the context of rapid shifts in global governance mechanisms and the UN’s Sustainable Development Goals. Like its predecessors, it challenges conventional wisdom while pioneering innovative new approaches to the field. The Watch provides information and analysis embedded in a vision of the world and of human society that is more just, more equal and more humane. GHW5 was coordinated by the People’s Health Movement (PHM), Asociacion Latino-americana de Medicina Social (ALAMES), Health Poverty Action, Medico International, Third World Network (TWN) and Medact. Visit the Zedbooks or Hesperian online store to purchase.